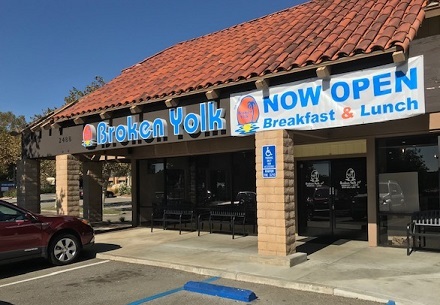 A San Diego-based chain, Broken Yolk opened up in La Verne in October in the Target center. I’d never heard of it — Broken Yolk, not Target — but decided to give it a spin recently, meeting a friend for lunch. It’s breakfast and lunch (and weekend brunch) only at the Yolk, a mid-sized coffee shop. Apparently weekend crowds are intense, but for a weekday lunch, seating was no problem. 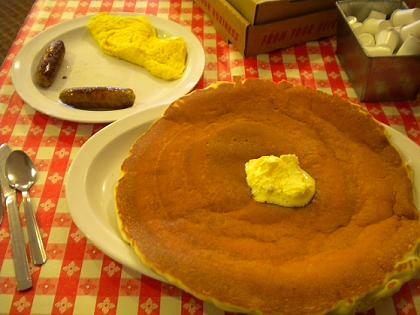 The chain is known for big portions, like four-egg omelets and large pancakes, as well as French toast made with Hawaiian bread. The menu can be seen here. 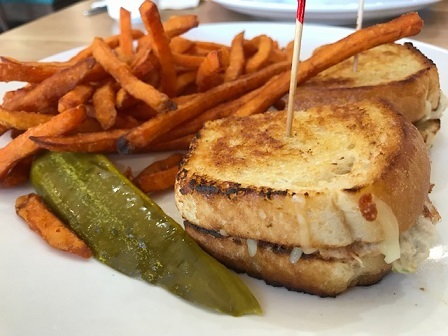 Careful readers of this blog may recall that the tuna melt is my baseline sandwich, the one I’m likeliest to pick at an unfamiliar restaurant if it’s on the menu. This was an above-average version, fresh and with jack cheese. People on Yelp seem inordinately gripey about the wait times for weekend breakfast, making me wonder if they’ve ever gone out for breakfast before. 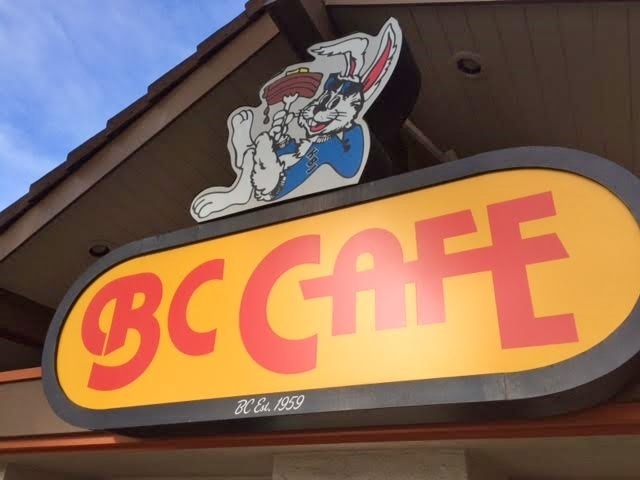 Drive past BC Cafe on a weekend morning and you’ll glimpse one or two dozen would-be patrons scattered out on the lawn waiting for a table inside to open. Anyway, Broken Yolk’s got a varied menu, service was attentive and the food is pretty good. Despite the name, I’ll bet they will give you an egg sunny side up if you ask. Drive by BC Cafe any weekend morning and you’ll see people standing in small groups outside, waiting for a free table. 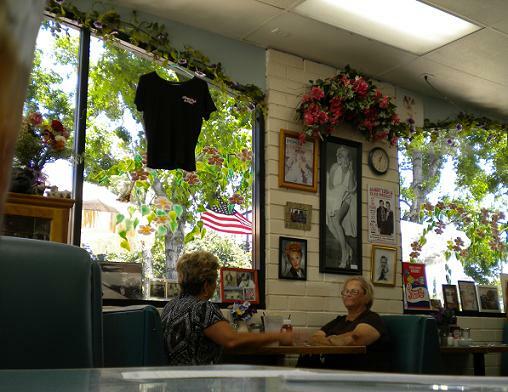 It’s a big-breakfast spot, with roots dating to 1959 in Pomona, where it was named Breakfast at Carl’s, before moving north and shortening its name at some later point, the ’80s or ’90s. The name is somewhat confusing, incidentally. The owners attempted to brand the place as Kickback Jack’s, with a cartoon mascot of a Jimmy Buffett-like jackrabbit, but that’s only stuck at the second location, in Rancho Cucamonga. The website for both is KickbackJacks.com. But a change of the Claremont sign lasted a couple of weeks before the BC Cafe name was hastily restored. I’ve eaten at both locations but primarily at Claremont’s, although not for years. For my birthday in March, though, I decided to treat myself to banana pancakes there. BC was just as I’d remembered, even if the Howard Johnson’s behind it is now a Knights Inn. On a Monday morning, there was plenty of seating. The breakfast menu is extensive. They also have a variety of smoothies, not to mention a variety of milkshakes, on a beverage and desserts menu. I got one pancake, plus egg and bacon ($9.03). (You can get two pancakes with egg and bacon/sausage for $11, or the two pancakes alone for $9, but two would have been too many.) The sides were fine and the pancake very good, with bananas cooked right in, as I’d recalled, rather than placed on top as an afterthought, as at most restaurants. Figuring I ought to try them for lunch too, I returned a few weeks later, at about 1 p.m. There’s a sizable menu of sandwiches, burgers and salads. 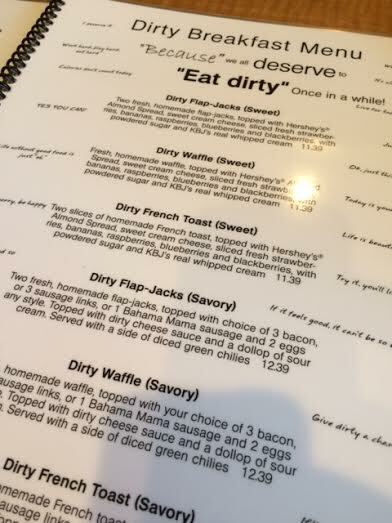 There’s also something called the “dirty” menu for both breakfast and lunch, where all the items have “dirty” in their names. It’s evidently less healthy items, although that’s muddied by “dirty kale Tuscany salad,” which hardly sounds like an indulgence. The print version is poorly designed and really should be rethought. Also confusing: The back of the staff T-shirts promote “dirty donuts,” but they’re not on the menu that I could tell, and I forgot both times to ask about them. I ordered off the specials menu, a half Frisco baguette ($8.89), which is a roll with chicken, onions and mushrooms, all grilled. What is “Frisco” about this sandwich is unknown; it’s a chicken Philly without cheese. It came with fries, plus soup or salad. There was a problem here: The first soup I ordered wasn’t available, and as for the second, the server returned and reported that they’d all been sitting for a while without heat and that she wouldn’t serve them. She recommended a salad, which I got, and which was fine. This may be a fluke, but it doesn’t say much for the kitchen. It does, however, say a lot for the server. Naming issues aside, the sandwich was quite good, and I don’t know how I would have eaten the full version. Besides the salad and fries, there was a cute little cup of tapioca pudding (awww), a pickle slice, an orange slice and a teensy box with two pieces of Beechwood gum. Such a deal. So, BC Cafe has awfully long menus, the sort of thing that leads to suspicion of overreach. Except both my meals were really good. “Since 1976,” the monument sign outside reads, enticing this history lover whenever I drive past this spot near Chino City Hall. The fact that the 3 p.m. close doesn’t work for an evening council meeting made a visit more of a challenge — one I accepted. There’s a spacious dining room that must seat more than 100. 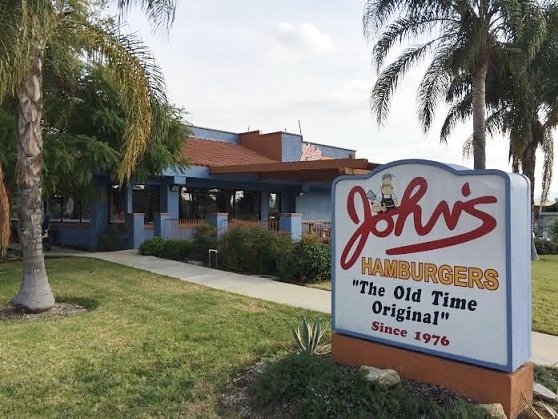 John’s reminds me of a few other burger spots around the valley, like Terry’s in Rancho Cucamonga, where there’s a wide-ranging menu and a seasoned staff of actual grownups. Even though you order at the counter, the place fulfills a Denny’s-like function, with the veteran staff reminding you of diner waitresses. 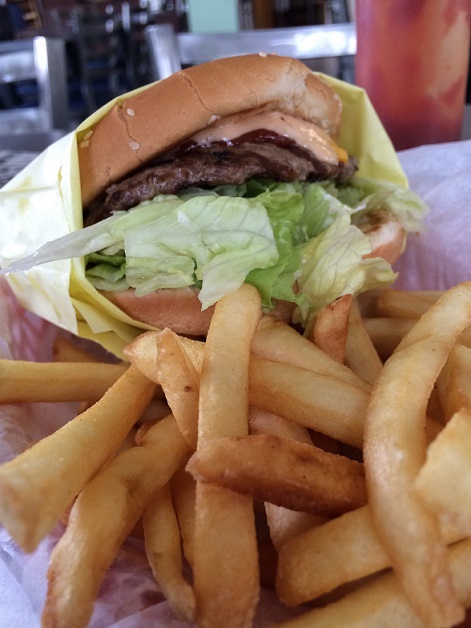 As it’s John’s Hamburgers, I got a cheeseburger with fries and soda ($7.28 with tax). It was your standard fast food meal, alas, not one to encourage a second visit from the distant land of Rancho Cucamonga. A closer look at the menu, though, showed more ambitious burgers, such as a hand-pressed 10-ounce Super Burger ($6), a meatloaf sandwich and more. 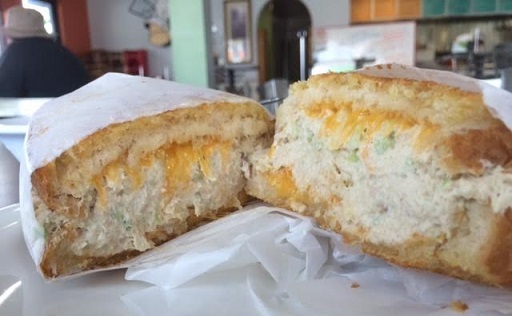 Feeling a little foolish, but wanting to give John’s a fair shake, I once again ventured deep into the heart of Chino for a second lunch, this time ordering an albacore tuna melt ($6), which careful readers will recall as my baseline sandwich. Served on grilled sourdough, this was a pretty good sandwich and redeemed the place. 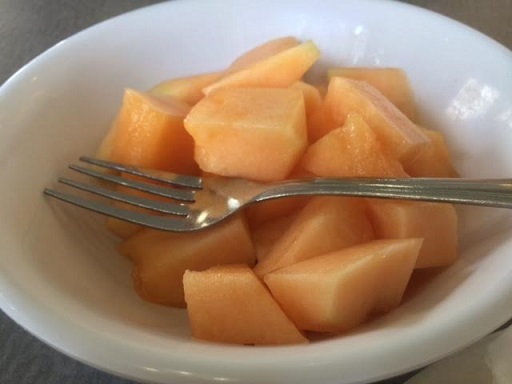 On the other hand, I substituted “fresh fruit” for fries and was confronted with (sigh) an entire bowl of nothing but cantaloupe, which was dispiriting. If they’re going to go to that little effort, why not just hand customers a banana? I’d like to go back for the meatloaf, but I decided to cut off my research here rather than make a project out of the place. John’s is okay, if unexciting. But maybe soon to become peppier: A sign on my last visit read “Beer and wine coming soon” — how about that? Congratulations to them on 40 years in an ever-changing world. 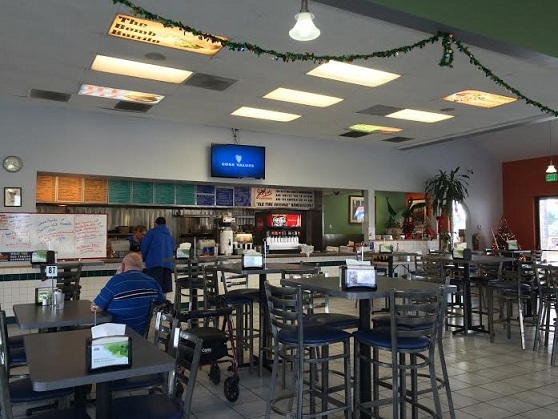 Some of you may remember when the Homestyle Cafe was in Guasti, the old winery village near Ontario Airport, and was beloved by truckers and families alike who liked the big portions and homey atmosphere. 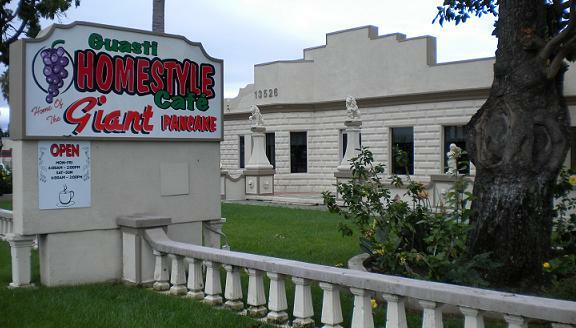 After its demise, the similar Guasti Cafe opened on the site under different owners before having to move in 2007 due to pending redevelopment. 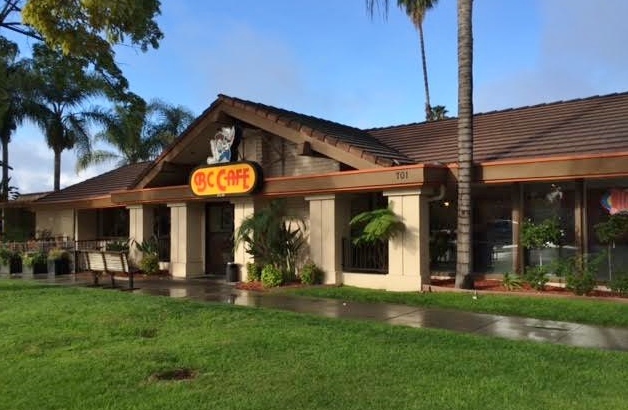 Now using both names, the cafe is 7 miles southwest in Chino, in a former pizza parlor with a sprawling layout, stone lions out front and a small chapel in back. The masonry building dates to 1923. I don’t know how many customers made the move, but on a recent visit, I recognized several employees from the previous location, including the longtime cashier and a couple of the servers. 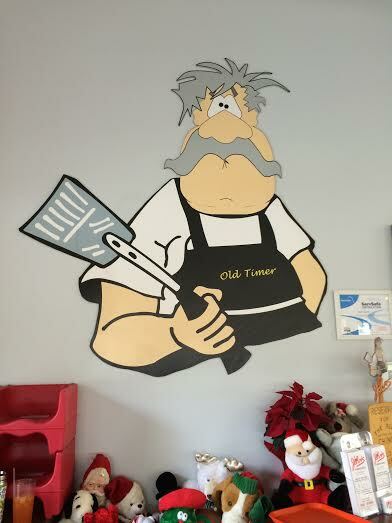 The manager is Tommy Hornbake, formerly of Ontario’s Iron Skillet. 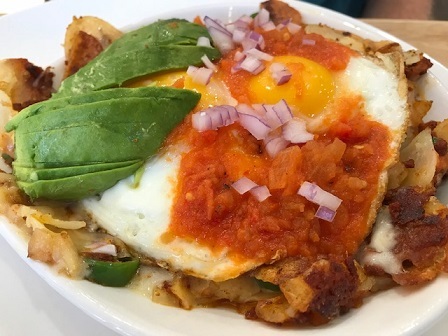 The menu is pretty similar to the old place, emphasizing breakfast staples but also adding soups, salads and sandwiches for lunch; weekday hours are 6 a.m. to 2 p.m., and until 3 p.m. on weekends. I’ve never been there for lunch but I’ve made it in for breakfast a couple of times. 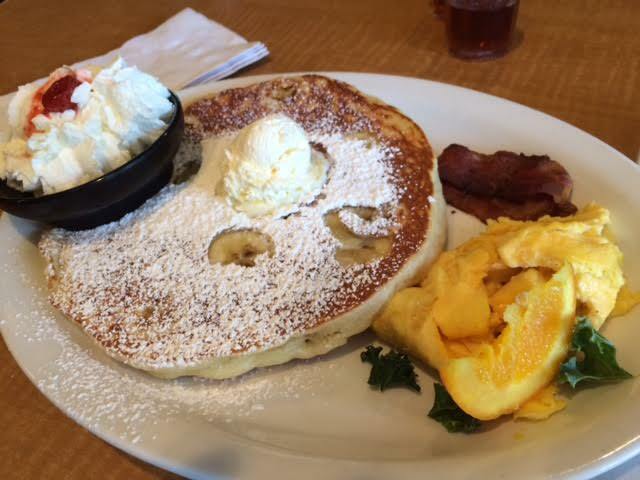 The pancake combo ($9) provides two pancakes, two sausages or bacon strips and two eggs. 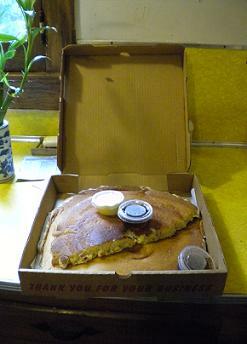 The eggs and sausage were fine; the pancakes are a foot in diameter and nearly an inch high in the center. I’m not a “big food” fan, but if you are, this is the meal for you. They’ll give you a pizza box in which to take home your uneaten pancake portion. That’s my kitchen counter and takehome pancake-and-a-half at left. Plop the pancake on a plate, put a paper towel on top and zap it for 45 seconds or so. I got five meals (!) out of this one order: one in the restaurant and four at home. Not bad for the money, although I didn’t feel like eating a pancake again for a couple of weeks. One of my favorite breakfast spots, Nancy’s opened in 1994, faltered a couple of years ago due to a divorce and returned as good as ever in April 2009, the namesake Nancy back at the helm. It’s open 6 a.m. to 2 p.m. seven days. The strip center behind a Jack in the Box doesn’t look like much, but Nancy’s is a cozy place, cheery in both decor and service. Nancy’s collection of pig-themed objects, some large, some tiny, are placed subtly throughout the restaurant. 1950s music plays constantly and employees occasionally sing. For breakfast, Nancy’s has all the standards. The pancakes are especially good. 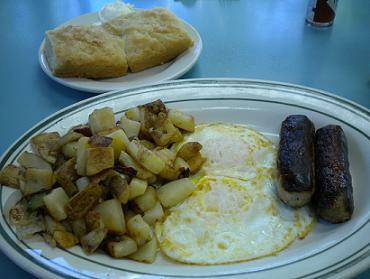 On a recent visit I got the two-egg breakfast with sausage, country potatoes and biscuits ($6.95). A very good meal, and the sausage is among the best I’ve had, plump and meaty. I’d never had lunch at Nancy’s, though, so I went in on Wednesday to try it out. Lunch is strictly burgers, sandwiches and salads. I got the turbo turkey melt ($8.95), which came on sourdough. My choice of sides was cole slaw, a decent version. The sandwich was filling and tasty; there’s an attention to quality here. A tiny cup of jello was on the side. Half a chocolate cake was perched on a domed pedestal on the counter a few feet away, but I managed to resist. In fact, my meal was so filling, I didn’t even eat dinner. Thanks, Nancy’s. 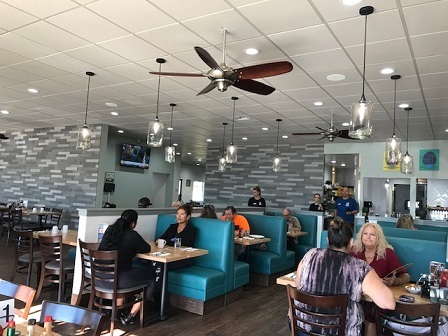 This week’s restaurant: Brandon’s Diner, 8689 Base Line Road (at Carnelian), Rancho Cucamonga; also 870 E. Foothill (at Campus), Upland, and 10271 Magnolia, Riverside. 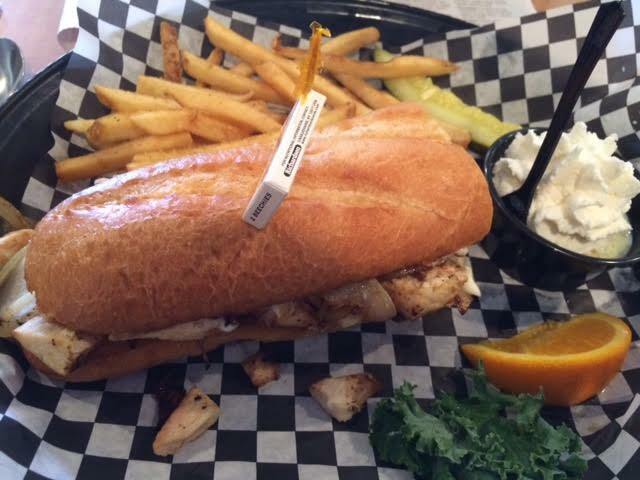 Brandon’s is a hugely popular breakfast spot, and maybe lunch and dinner spot too. For whatever reason I’d never been there. 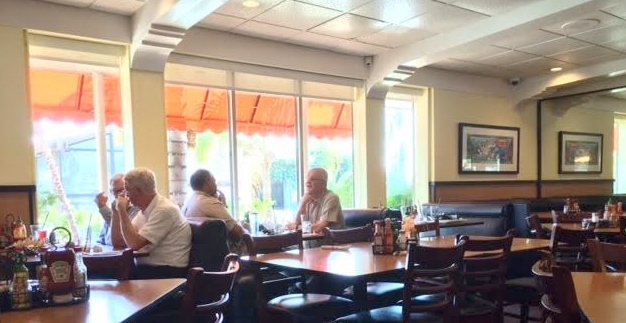 An online review at the Dinerwood site (an LA guy, he’s also reviewed BC Cafe) caught my eye a while back, so last Saturday, a friend and I went in for breakfast to the Rancho location in the Sunrize Center. Even at 10:30 there were five small groups waiting for a booth, but the wait wasn’t long. Inside, Brandon’s is surprisingly old-school: tile floor, booths, a long counter with swivel seats and signs with regular daily specials. The kitchen is in the back, not behind the counter. They have the full complement of breakfast items as well as sandwiches, Mexican food and dinner plates, plus beer and wine. I had the half French toast combo with two eggs and two sausages ($7.45); my friend had Polish sausage, two eggs, home fries and two French toast halves ($7.95). The sausage links were plump, some of the best I’ve had. However, my over-medium eggs arrived over-easy. My friend’s Polish sausage, split and grilled, was tasty, and the scrambled eggs very nice when flavored with the two (!) kinds of salsa brought to the table. However, she described her watery coffee as perhaps the worst she’s ever tasted. “This is like gas station coffee,” she said, before quickly deciding that even gas station joe is better. So Brandon’s isn’t perfect. That said, we enjoyed our meal and the atmosphere, and also the people-watching. The clientele was diverse — whites, blacks, Latinos — and included a Goth couple, the woman in white gloves, the man in Kiss-style platform boots, striped pants and a belt buckle that read “666.” Goths tend not to smile so it was hard to tell if they were enjoying themselves. They certainly livened the place up for everyone else.